If you are missing one or more teeth, dental implants are the most natural-looking and aesthetic way to replace them. Dr. Bader has been restoring implants since 1987. He will present all your options to help you determine the best way to replace your missing teeth. Tooth loss can be the result of tooth decay, gum disease, trauma, periodontal disease, or congenital defects. Missing teeth can cause low self-esteem, eating problems, speech problems, and further tooth damage. Tooth loss can also cause the surrounding teeth to shift around, creating an unbalanced bite that may lead to problems like jawbone loss, TMJ disorder, and headaches. Dental implants are a permanent solution that will look and function like your natural teeth. Strong and durable materials are used to create a result that enhances your smile, health, and confidence. 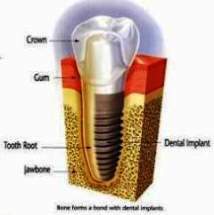 There are two main parts to a dental implant: the root form and the restorative crown. Implantation is a surgical procedure that requires healthy gums and bones to support the root and replacement material. An oral surgeon will place a titanium post into the gum to serve as an anchor. You can see how the root form is implanted into the jawbone in the image shown on the right. After a period of osseointegration, during which the surrounding bone grows around the anchor, the restorative crowns are placed. The healing process between the surgical phase and the restorative phase takes from three to six months. Once the implant area heals, a temporary crown is placed over the implant to let the gum grow naturally around it and protect the area while a permanent crown is made. When the osseointegration process is complete, the permanent crown is placed. The dental implant procedure is one of the most successful dental procedures performed today. It restores the strength and physical appeal of the lost tooth without affecting any others. Dental implants require a commitment of proper oral hygiene and regular dental visits. With proper care, dental implants can be a lifelong solution for missing teeth. Dentures: While dentures can help restore self-confidence and make chewing more comfortable, they are also often the source of embarrassing slips, noises, discomfort, and reduced chewing efficiency. Partial Dentures: Although partial dentures provide effective replacements for missing teeth, they can be uncomfortable to wear and place stresses on your remaining natural teeth. Implant Overdentures: Implant overdentures offer all the benefits of traditional dentures with added security, comfort, and ease. Your dentures are held in place by several roots implanted into the gums for extra support that allow you to chew food better and speak more clearly. Implant overdentures also eliminate the need for messy creams and adhesives. Dr. Bader is experienced and educated in performing this simple and safe procedure. Dental Bridges: Dental bridges are used to replace one or more missing teeth, but have to rely on surrounding healthy teeth for support. This procedure can cause damage to healthy teeth and may lead to future tooth loss. Implant Bridges: Implant bridges provide strong, natural-looking replacements but rely on implants in the jawbone for each missing tooth. The crowns for each tooth are connected to form one piece. The implants provide the comfort and support of a traditional bridge without any damaging side effects. Implant bridges offer a stronger permanent solution to restore your natural smile and make missing teeth a worry of the past. To learn more about your options, please visit our dental bridge versus implants page. To find out if you are a candidate for implants, you may schedule a 10 to 15 minute complimentary consultation with Dr. Bader. This is not an examination but an opportunity to ask him any questions you have, free of charge. Call our office today at (617) 795-7170, or visit our request an appointment page, and find out if you can benefit from implants.